'Twiz the season for gift giving (and to be jolly) so I'm here today to share a super cute gift idea using Little Yellow Bicycle's Once Upon a Christmas collection. 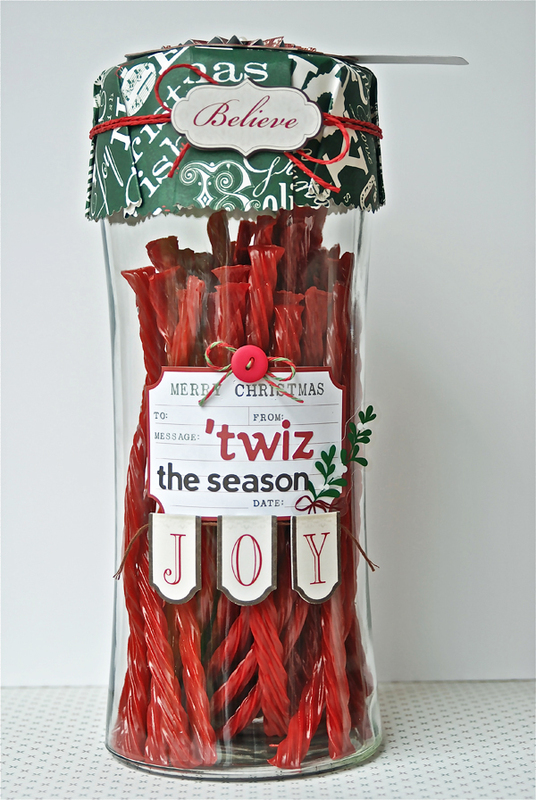 I transformed a plain glass jar with a metal lid into a super cute gift idea featuring Twizzlers red licorice sticks. To create a topper for the existing lid, I traced a dinner plate (my "go to" circle template) onto a 12x12" sheet of patterned paper, making sure the diameter (of the plate) was a couple of inches larger than the lid. 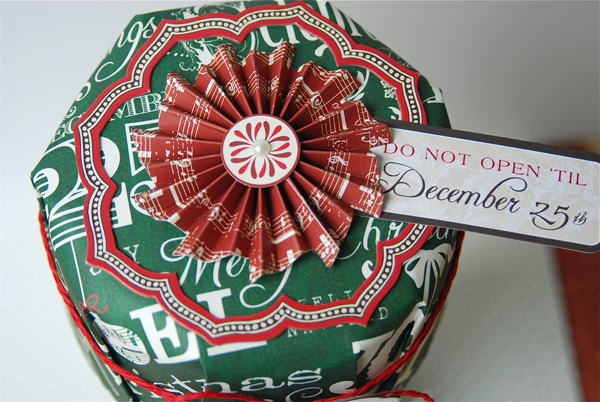 I used scalloped scissors to cut the circle out because I wanted it to have a decorative edge. I centered the circle on the lid and then used my hands to form it to the lid, allowing pleats to happen naturally. The paper lid sits very nicely atop the jar, but can be easily removed (and keep its shape) when you want to open the jar to grab a little treat. 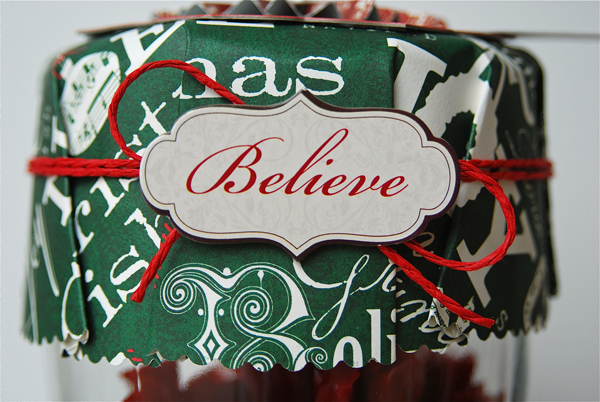 For the front of the jar, I used a journaling card to hold the sentiment and added in a few embellishments. I think it looks fun and festive and would certainly make a great (and easy) gift for a neighbor, teacher or friend. What's your favorite holiday treat to gift? OMYGOSH!!!! This is ADORABLE!!! I loveeeeeeeeeeeeeeeee that rosette on top and loving the play on words!!! Seriously?! That rocks! Awesome project Lisa! So sweet!! ;) I love it! Great work! Hee hee. LOVE the pun! Super adorable treat jar. Great idea and a perfect holiday treat! what a cute idea. Love the papers. I make LOTS and LOTS of buckeyes for DH's work and package them up. Such a SUPER CUTE idea!! Love the colors and the idea behind the label - love it! Can I send you my address?! LOL!! YUM~! love the title for you post today!! this is so super cute!! Wonderful idea! One of my favourite candies...yum! Will definitely be doing some treat gifts, this year for Christmas! what a great idea! i never thought of this! we have some dirty santa gifts to give and this would be FAB! Thanks for sharing! Super cute, this will also look adorable sitting around. How fun and adorable is that. I love twizzlers - yum!! oh that sentiment is super cute! What a great idea! Cannolis I guess:) Wish we have twizzlers here in Sicily. I see that you worked in a bakery shop. That's where my daughter www.hungrycaramella.blogspot.com would love to work. I grew up in New York so I love to make brownies, apple pie, cinnamon rolls etc. and she grew up eating them so she loves American sweets. A friend recently sent us candy corn for Halloween, when Sicilian kids came for "dolcetto o scherzetto" (trick or treat) they were delighted to get American candy. I am following you. I will tell my daughter to follow you too.Happy Thanksgiving! Oh! too cute! Great idea, and love the top! So perfect! 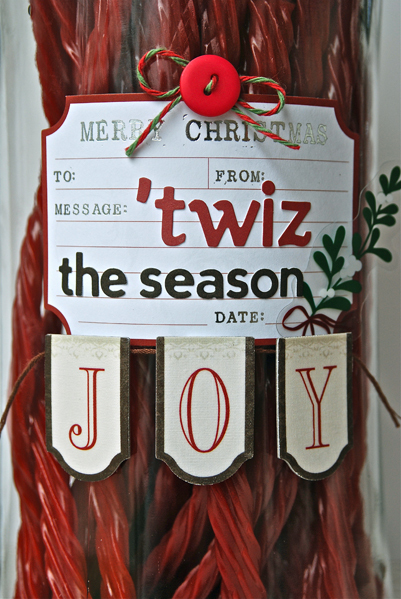 I love this idea for a friend of mine who loves Twizzlers- thanks for sharing your talent!